Thanks to Go Biofriendly one of the great problems associated with eating outside has all been taken care of. 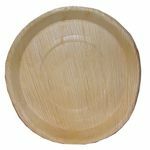 Their plates and other tableware and cutlery are all made from 100% natural and biodegradable materials. So these 18cm plates have been responsibly made and can be responsibly disposed of. Now that’s a weight off. Not only that, they look wonderful too. They’re pleasingly rustic, but could happily sit in any top-of-the-range picnic hamper. At 18cm this is a nice size plate but compact enough for lighter bites too. 18cm Round Palm Leaf Plates x 25 has not been evaluated yet.